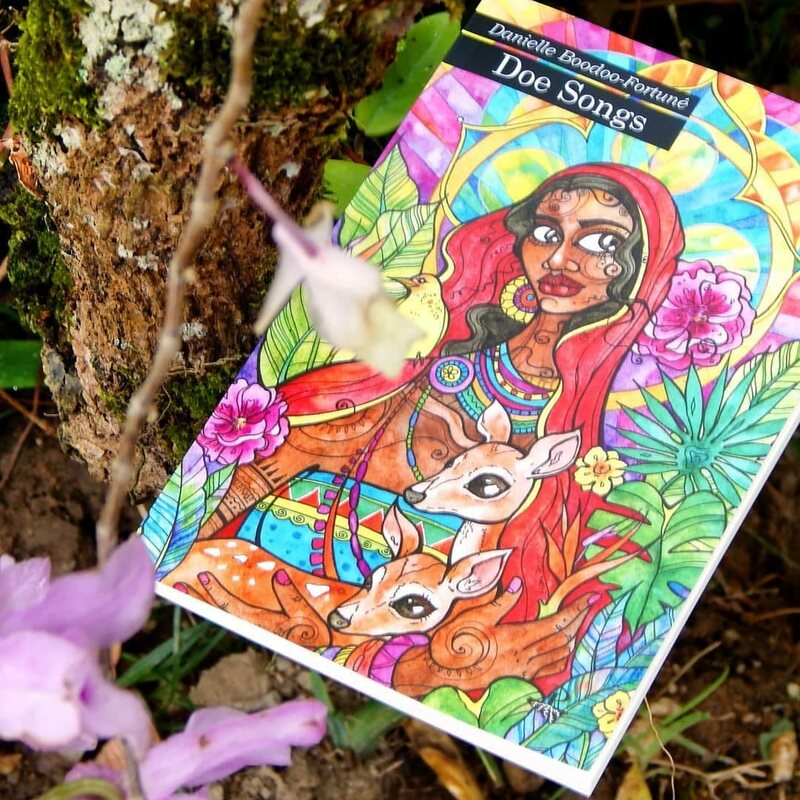 Doe Songs, Danielle Boodoo-Fortuné collection of poems. Danielle Boodoo-Fortuné’s Doe Songs (2018), reviewed by JENNIFER RAHIM. Doe Songs, Danielle Boodoo-Fortuné’s debut collection, is not a book to be read and digested in one sitting. The poems invite rumination and stretch the reader at all levels of heart and imagination – the surest signs that one has encountered a poet of significant power – and Boodoo-Fortuné has only just begun to exercise hers. The themes are familiar in that they largely belong to the broad canvas of concerns with the labyrinthine world familial relationships, mothers and mothering, daughters and parents, the intricacies of love, the relationship to place, the natural and spirit worlds. Their treatment, however, is far from commonplace. In fact, there is an unforced originality about this poet. Among the most powerful poems are those that engage family and love. Boodoo-Fortuné does not spare us their difficulties. She shuns romanticism and bravely confronts the sometimes harsh realities of our imperfect human garden. A mature wisdom informs lines that refrain from easy didacticism while remaining soberly engaged with human weakness and the need to garner strategies for healthy flourishing. The poet, herself married and a new mother to a son, mines the traumatised family histories across entangled generational lines, as if to warn herself against walking those destructive paths, even as she seeks a vital connection. 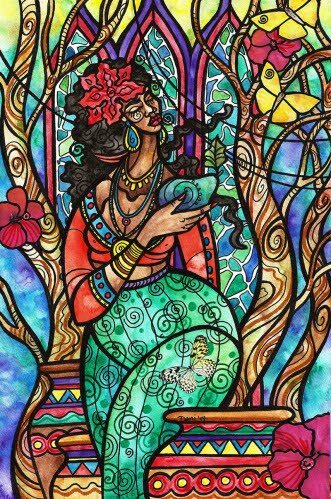 Zaboca goddess by Danielle Boodoo-Fortuné. Foremost in these songs, which are many times laments, is the narrow divide between passion and obsession, surrender and subjugation. In such a world, “love” or its distortions can be a brutal game for women, and men alike. The poem A Hammer to Love With, for instance, cryptically unravels the harsh but pragmatic maternal legacy bequeathed the poet. It cautions against naïveté and weakness, for “a heart too soft/will fail.” The female relation is portrayed rapaciously dragging home her catch, the hammer “between her bone sharp teeth.” She is as dangerous as she is vulnerable. Women are not simply victims, though. They can appear as wounded hunters and insatiable lovers. There is, too, a certain kind of beauty and strength in vulnerability which the poet touches in her moving poem Mother in the Morning. Consciously unshackled from domestic work, her mother digs without gloves “not afraid of the damp, dark earth/with its shards of buried glass and crawling creatures,” suggesting a learnt openness to the possibility that life will wound. The poet’s personal stance, however, is to find in herself the capacity to be vulnerable without being defeated, not clad like the mother-figure in the “colour of hurt.” Power in the context of male-female relations and mothering is interrogated in its many aspects by Boodoo-Fortuné’s complicated, multifarious engagement with the feminine, from which she attempts to draw life lessons. In this age of growing concern with environmental and ecological destruction, Boodoo-Fortuné is a voice that reminds us of the interconnectedness of the cosmos, connections that are as material as they are spiritual. Hers is sensibility enrapt with place: land, seascapes, and their creatures. All inform the imaginative lens through which she sees and know. Her tragic but tender doe poems move seamlessly through an engagement with the vulnerability of wildlife to destruction by human beings to the power of nature as a ready teacher as well as its own source of nemesis. Poet Danielle Boodoo-Fortuné is also an artist. 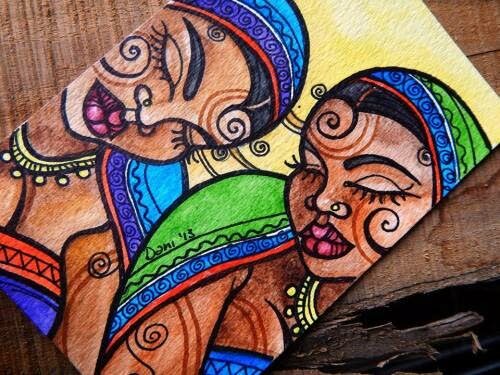 This piece is called The Sisters. While in time Boodoo-Fortuné’s concerns will expand and change, I believe what she achieved with theme and form in this first collection of poems will remain the foundation of her work. She tries, as in allegorical story-telling, to move us out of compartmentalised comparative thinking to a fresh engagement with what the image, the nature of things or what is simply there but is often beneath our seeing. The reader is gently weaned off any tendency to simplistically dichotomise the differences between beings/things. Almost like the way concentrated seeing finally becomes sacramental, she attempts a poetic holding in tension of the fragile and volatile unity or totality of our being in the world. At her best, she achieves a marriage of vision and artistry, one that balances and moves unflinchingly through beauty and threat, tenderness and brutality, vulnerability and strength, brokenness and wholeness. What she is after, and these poems do not pretend to have arrived, is the human possibility of transcending all that can “undo,” every “weight” that keeps one under. Beauty, tender-ness, fecundity and possibility cohabit with the inevitable arrival of threat. 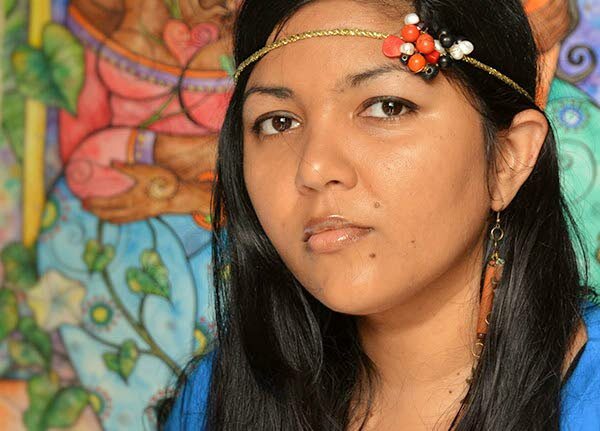 * Dr Jennifer Rahim, a former UWI lecturer, is a port and winner of the 2018 OCM Bocas Prize for Caribbean Literature.